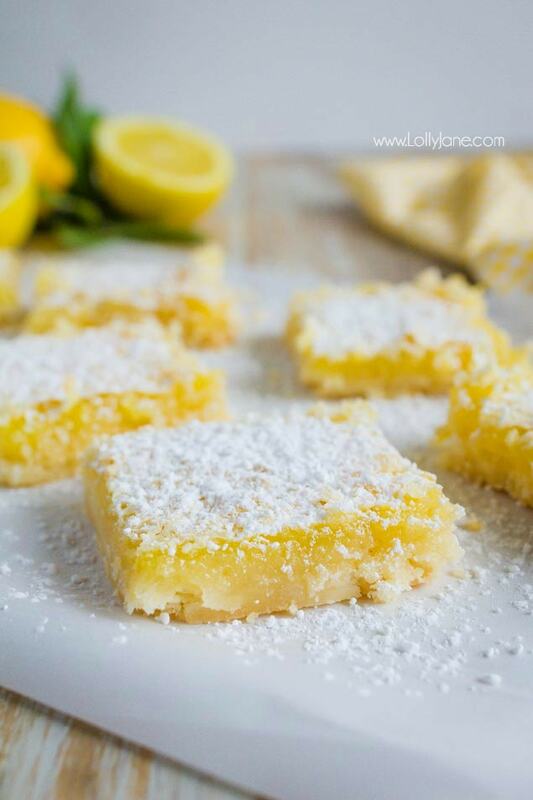 Easy lemon bar recipe, yum! 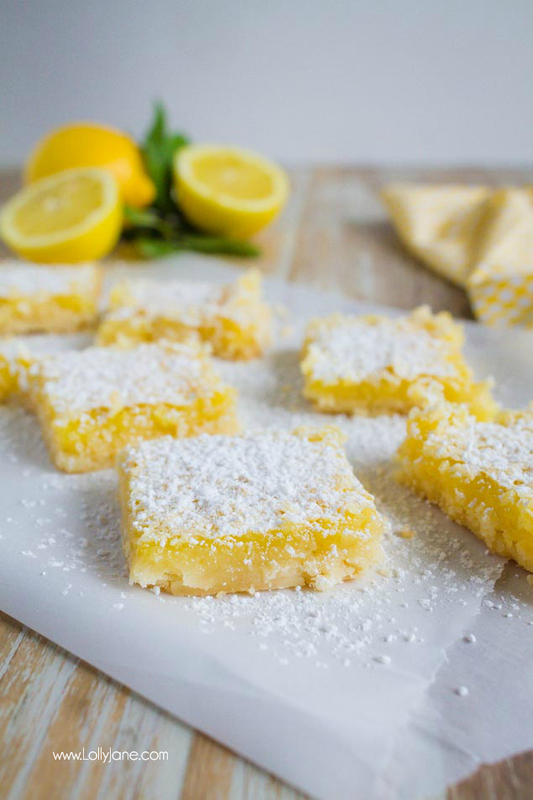 With the tanginess of lemons and a sweet dusting of powdered sugar, these must-bake lemon bars are a family favorite! I remember my grandmother making these lemon bars. Here in Arizona, citrus grows really well so we would pick the lemons from her tree and spend the day baking! 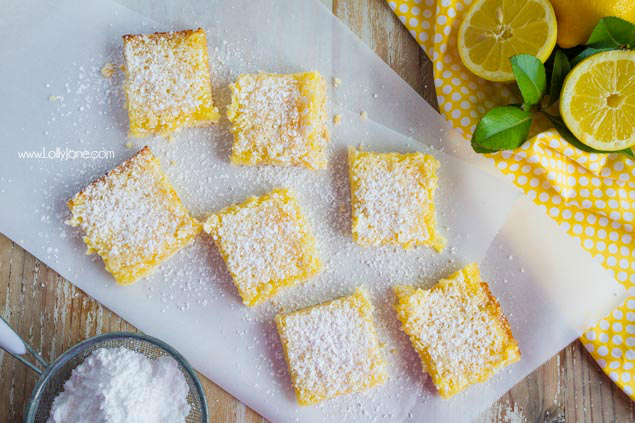 We sure love this easy to make lemon bar recipe. They’re also a family favorite favorite because they are easy to make plus one batch makes 25 lemon squares. 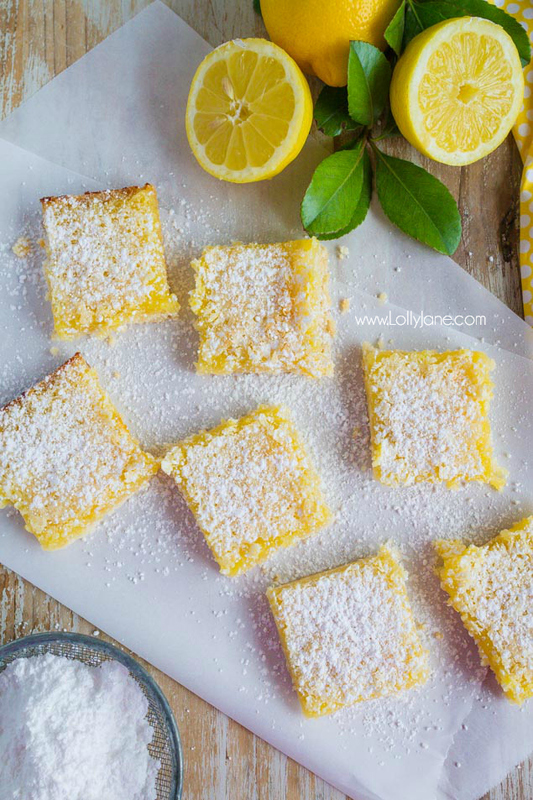 They’re definitely the best lemon bars you’ll ever have with their fresh squeezed lemon juice and grated peel. No worries, they’re still yummy if you use store bought juice and leave out the peel but we love that added sweetness of the real thing. 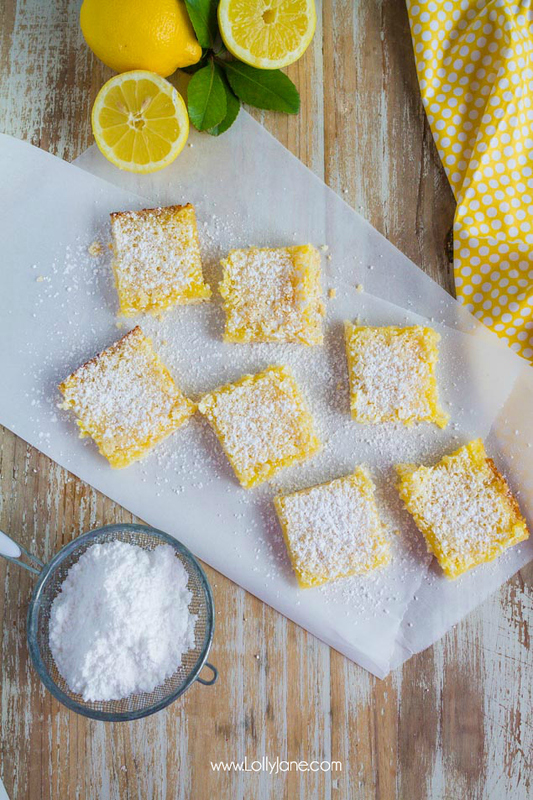 These lemon bars are perfectly chewy and just the right amount of sweet. Crust: Mix flour, butter and powdered sugar with a spoon. Press in ungreased pan, building up 1/2-inch edge. Bake 20 minutes. Lemon Filling: Beat remaining ingredients except powered sugar with electric mixer on high speed about 3 minutes, or until light and fluffy. Pour over baked layer. Mix flour, butter and 1/4 c powdered sugar with spoon. Press in ungreased 8×8 pan. Beat remaining ingredients except powdered sugar with electric mixer on high speed about 3 mins, or until light and fluffy. Bake 25 to 30 minutes, or just until almost no indentation remains when touched lightly in center. Cut into 5 rows by 5 rows. NOTE: These will taste better and more lemony with fresh squeezed lemon juice versus bottled juice. How do you make a lemon zest? Wash your lemon well then scrape your citrus across a cheese grater. So easy! Do lemon squares need to be refrigerated? No, but we personally love them cold. How long can you keep lemon squares? In or out of the fridge, they’ll last up to 3 days. Why are my lemon bars brown on top? It usually means it’s in too small of a baking dish so it’s too thick. Yes, you can salvage lemon bars that have browned on top. Simply pull them out, scrape off the brown crust with a spatula ( use a knife around the edge), drop the temperature by 10 degrees then put them back in the oven for another 10 minutes until cooked evenly. Can you freeze the lemon squares? Yes! Let the lemon bars reach room temperature and place them on a baking sheet then place the baking sheet in the freezer until the bars freeze all the way through, about two to three hours. THEN wrap each lemon bar in plastic wrap and place them in a sealable freezer bag. Mark the date on the bag and use within one month for best quality. I LOVE lemon bars! I mean – I love them!! Thanks for sharing at the What’s for Dinner party! Hope to see you next week too. I love lemon bars and the last recipe I made was ok but, this looks divine! I know I’ll try it thanks. PS love the note in comments that you can freeze them as there are only 3 of us at home. I would never want to EAT them ALL. lol or would I?? 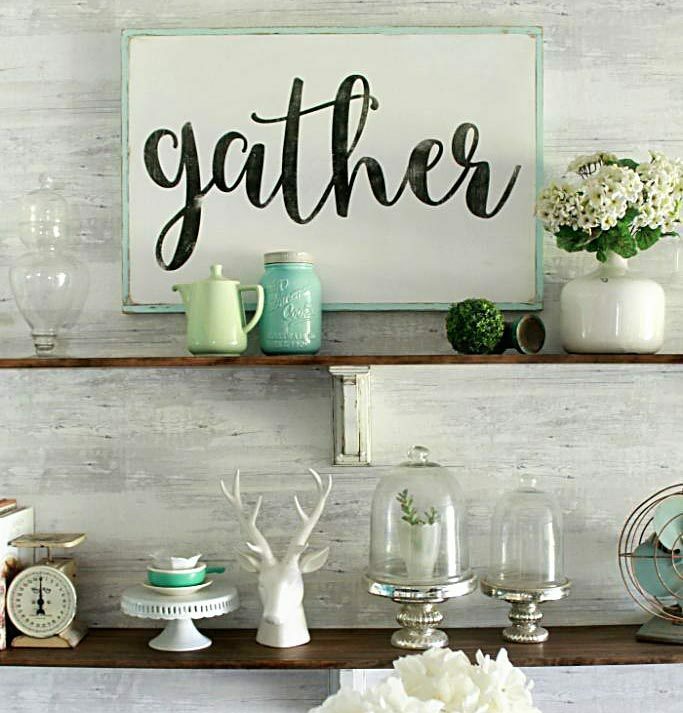 Thanks for sharing at the Inspiration Spotlight @DearCreatives pinned and sharing. These look absolutely amazing, I bet a it tart and moist! It looks amazing and making my mouth water! !